Happy Earth Day! To celebrate the occasion, I wanted to feature a trailer for a documentary about climate change and what we can do to save this big, beautiful planet we all live on. 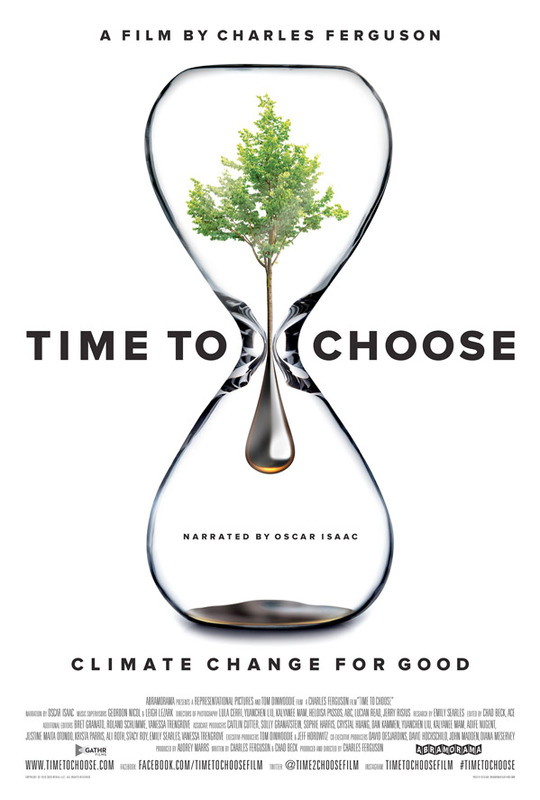 Time to Choose is the latest documentary from Oscar-winning filmmaker Charles Ferguson (of Inside Job, which won Best Doc in 2010; No End in Sight) and it focuses on the many people around the world actually coming up with and implementing creative solutions to the climate problem. It's a fantastic doc that I highly recommend. "We hope that when audiences see this film, they will see the tragedy unfolding, the urgency of stopping it, and all the remarkable and innovative ways we are using to build a sustainable, prosperous future for Earth." "First people deny there's a problem. Then they deny there's a solution." Featuring narration by actor Oscar Isaac, Time to Choose leaves audiences understanding not only what is wrong, but what can to be done to fix this global threat. Ferguson explores the comprehensive scope of the climate change crisis and examines the power of solutions already available. Through interviews with world-renowned entrepreneurs, innovators, thought leaders and brave individuals living on the front lines of climate change, Ferguson takes an In-depth look at the remarkable people working to save our planet. Time to Choose is directed by Oscar-winning filmmaker Charles Ferguson, of Inside Job and No End in Sight previously. This premiered at the Telluride Film Festival last year. Time to Choose opens in select theaters starting on June 3rd this year. I am a lot more terrified of global dimming. That's the real bad one. I want to think it will be like one of those bad 8-'s movies where people mess about for around 60 minutes not really bothering about anything, then pull together in the last act to fix a problem and be legends forever by doing one good deed. But really the earth will swallow most folk up. Humans will survive, the earth will move on. It makes me sad for my son, we all saw how quickly society disintegrated during the aftermath of hurricane Katrina, imagine that but there being no recovery. Places like California running out of water might make an impact on peoples minds, but maybe not. Folks seem pretty blind to it all.